The Colorado Avalanche announced today that the team has signed defenseman Tyson Barrie to a two-year contract through the 2015-16 season. Barrie, 23, led all Colorado defensemen with 13 goals this past season, the most by an Avs blueliner since 2006-07 (John-Michael Liles - 14). Barrie finished second among Avalanche defensemen in both points (38) and assists (25) while appearing in 64 games. The Victoria, B.C., native scored three overtime goals last year, tying the single-season franchise record set by David Jones in 2010-11. He was the first NHL defenseman to score three OT goals in one season since Atlanta’s Dustin Byfuglien in 2010-11. Barrie tallied five game-winning goals, tied for third among NHL defensemen and the second-most by a defender in franchise history (Derek Morris, 7, 2002-03). He finished third on the team with a +17 plus/minus rating. Barrie went on to collect two assists in three playoff games prior to suffering a knee injury in Game 3 of the first-round series at Minnesota on April 21. 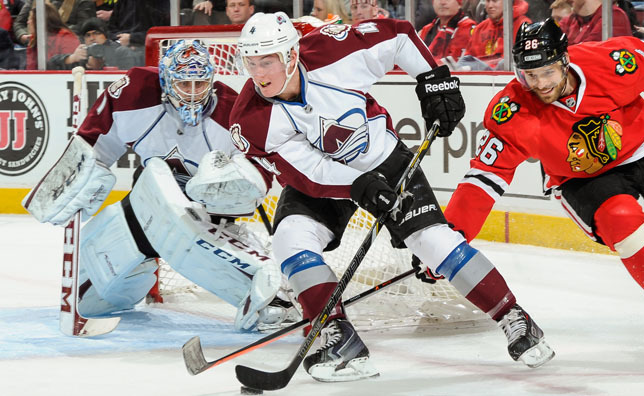 Selected by Colorado in the third round (64th overall) of the 2009 Entry Draft, Barrie has tallied 51 points (15g/36a) in 106 career games in the NHL. As a rookie in 2012-13, he led all Colorado defensemen in scoring with 13 points (2g/11a) in 32 games and led the entire team in average ice time at 21:34 per game. That was the second-highest average ice time among all NHL rookie defensemen that year (Jonas Brodin 23:12).